Today the U.S. Environmental Protection Agency (EPA) Inspector General found EPA Region 6 was justified in legally intervening to protect Parker County, TX residents’ drinking water from drilling impacts. At Sen. Inhofe’s (R-OK) request, the Inspector General investigated to determine if Region 6’s intervention against Range Resources was due to political influence by the Obama administration. 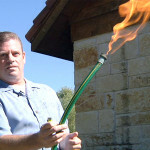 Steve Lipsky, who lives near a fracking operation in Weatherford, TX with his flammable water. Photo credit: Gasland Part II. The EPA invoked its power to protect drinking water in 2010, prompting Oklahoma Sen. Inhofe to request the Inspector General’s investigation in 2011. The EPA withdrew its legal complaint against Range Resources in 2012 despite having a report from an independent scientist showing that a gas well drilled by Range likely polluted nearby water supplies. The EPA’s withdrawal from Parker County appears to be part of a larger pattern, in which the Obama administration has blocked or abandoned investigations of whether drilling or hydraulic fracturing polluted drinking water. In addition to the case in Parker County, reports in major news outlets indicate that the Obama administration caused the EPA to abandon studies of potential drilling or fracking pollution in Pavillion, WY and Dimock, PA despite evidence of drilling-related harm. Just prior to the release of the Inspector General report, the Texas Railroad Commission (regulator of oil and gas, not railroads) opened an investigation into the case. The EPA intervened in 2010 to protect area drinking water only after the commission refused to do so. The Commission’s new investigation prevents the EPA from legally intervening now as it did in 2010.